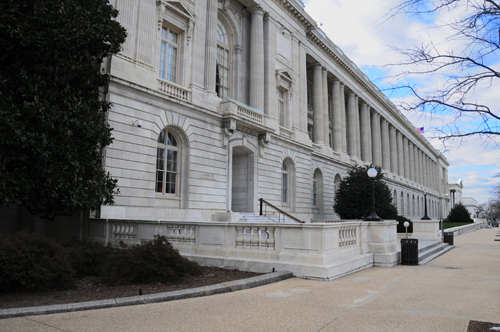 The Longworth House Office Building has a floor area of just under 600,000 square feet and is the smallest of the three House Office Buildings. It was built in the Neo-Classical Revival style and was finished in 1933. The large assembly room in this building was used in 1949 and 1950 as the meeting chamber for the House of Representatives while the chamber in the Capitol was undergoing remodeling. 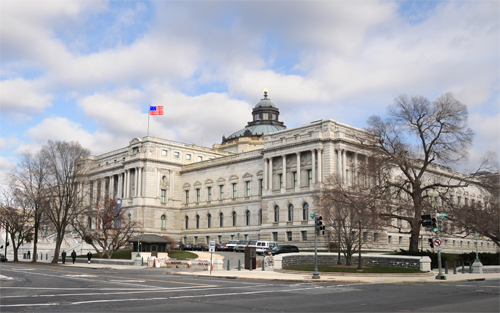 The Longworth House Office Building is located at 15 Independence Avenue SE, Washington, DC 20515. 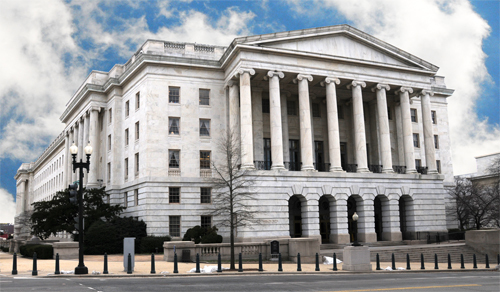 Click Here for Google Map showing the location of the Longworth House Office Building. 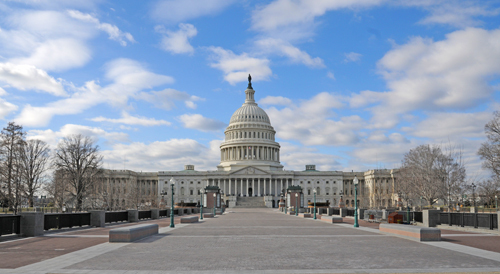 Closest Metro Station: The Capitol South Metro Station on the Blue and Orange Lines is nearest to the Longworth House Office Building. The Cannon House Office Building, the oldest of the congressional office buildings, was built between 1905 and 1908. 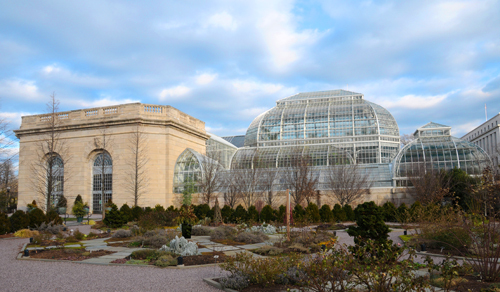 The building with an area of 671,921 square feet is built in the Beaux Arts architectural style. The photograph above was taken near the intersection of Independence Avenue SE and 1st Street SE. The main entrance is located at the intersection of Independence Avenue SE and New Jersey Avenue SE. Inside the main entrance is the Rotunda that is just over 57 feet in diameter. 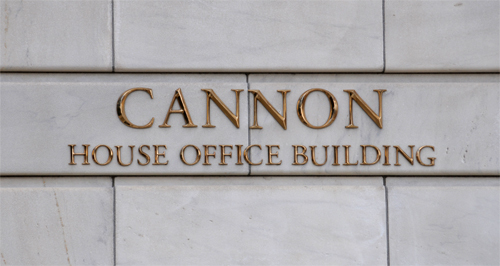 The Cannon House Office Building is located at 283 1st Street Southeast, Washington, DC. Click Here for Google Map showing the location of the Cannon House Office Building. Closest Metro Station: The Capitol South Metro Station on the Blue and Orange Lines is nearest to the Cannon House Office Building. Real World DC: In Episode 8 Mike goes to room 501 of the Cannon House Office Building to meet with his congressman Jared Polis, the Congressman from Colorado’s 2nd district. 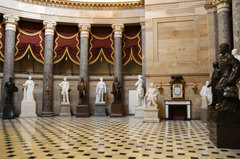 The National Statuary Hall is located in the United States Capitol and is south of the Rotunda. This was originally constructed as the chamber for the House of Representatives and was used as such after construction was completed in 1819. The semicircular room with its curved ceiling caused echoes that made it difficult to conduct business in the chamber. The House of Representatives moved into its current chamber in 1857. The room is now used for the display of statuary. Each state was asked to contribute two statutes of prominent people, and many of those statutes are displayed in this room. 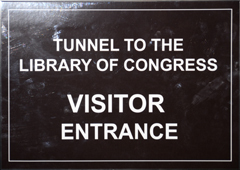 Visitor access to the National Statuary Hall is through the US Capitol Visitor Center. Click United States Capitol to see the StationStart.com entry about the United States Capitol and the US Capitol Visitor Center. 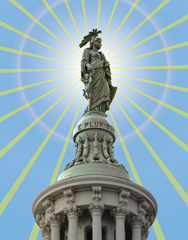 Crowning the United States Capitol is the Statute of Freedom by Thomas Crawford. 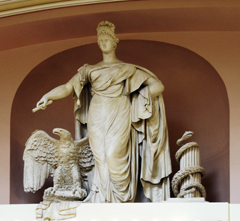 The female figure, originally known as the Freedom Triumphant in War and Peace, is 19.5 feet tall and weighs 15,000 pounds (7.5 tons, 6,800 kg). In her right hand she grasps the pommel and grip of a sheathed sword. The shield of the United States is held steady in her left hand which also holds a laurel wreath. Thomas Crawford created the full size plaster model of the statute in Rome, but he died in 1857 while the model was still in his studio. 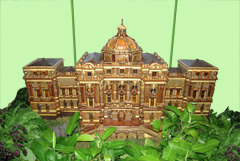 The six crates containing the plaster model all made it to Washington by March 1859. By late 1862 the statute had been cast in bronze in sections by Clark Mills, had been assembled and was on display on the capitol grounds. The last of the sections was installed in place atop the Capitol dome on December 2, 1963. 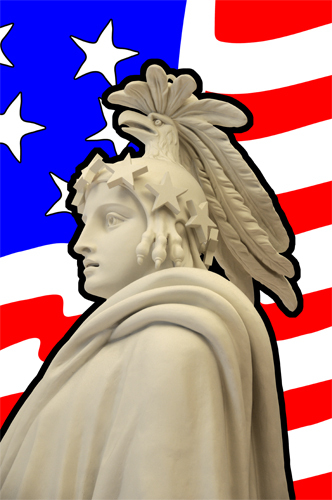 The plaster model is now on display in the Capitol Visitor Center. 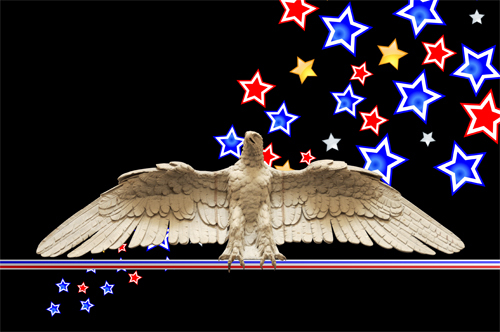 Click United States Capitol to see the StationStart.com entry about the United States Capitol. 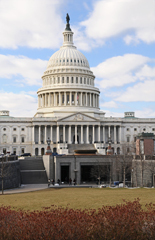 The United States Capitol is located at 100 Constitution Avenue NE, Washington, DC 20002. Click Here for Google Map showing the location of the Statute of Freedom. On the west lawn of the Folger Shakespeare Library is a marble sculpture of Puck (also known as Robin Goodfellow) . This character is from William Shakespeare’s play A Midsummer Night’s Dream. Puck, Oberon’s jester, uses magic to create mischief through deliberate efforts and inadvertent mistakes. 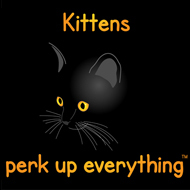 Puck is both a good natured and sometimes cruel sprite known to some as a hobgoblin. The 1932 sculpture by Brenda Putnam has been repaired and now has a silver sheen. Click Folger Shakespeare Library to see the StationStart.com entry about the library and Elizabethan Theatre. 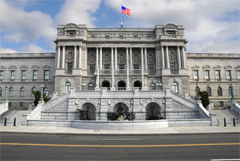 The Folger Shakespeare Library is located at 201 East Capitol Street SE, Washington, DC, and Puck is the central figure in a fountain at the west end of the building. Click Here for Google Map showing the location of the sculpture of Puck at the west end of the Folger Shakespeare Library. 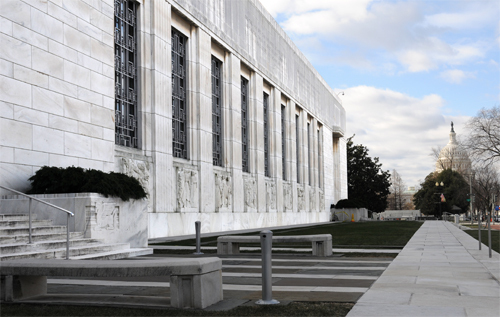 The Folger Shakespeare Library has nine large sculptures carved in white Georgia marble along the front of the building. These are the work of John Gregory (1879 – 1958). 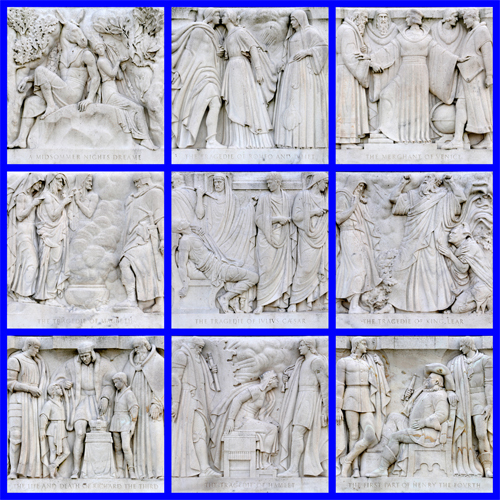 Each bas relief sculpture depicts a scene from one of William Shakespeare’s plays.